The MQSA Organising Committee thanks all our generous sponsors for the 2016 show, from small fabric retailers through to major Australian and international companies. They include retailers such as Cottage Quiltworks, Craft Depot, Fabric Garden, Frankenstein Fabrics, Kate Quilts, Material Girls Down Under, Material Obsession, My Sewing Supplies, Polka Dot Tea, The Remnant Warehouse and Quiltsmith; designers including Anna Maria Horner, Bill Volckening, Carolyn Friedlander, Lorena Uriarte, Victoria Findlay Wolfe, You Patch; equipment and accessories suppliers Annie’s Designs, Bernina Australia; wholesalers including Blessington, Busy Quilting, Leutenegger, Two Green Zebras, Millhouse Collections, Victorian Textiles and XLN; as well as the Australian Machine Quilters Association. Fiona Mason and Chris Roche, the principals of Two Green Zebras, have both worked in the textile industry for their entire careers. Chris started in the industry straight out of high school, and since then he has held almost every role in the business – from warehouse sweeper to sales manager to CEO! Fiona studied a BA in Fashion design at RMIT and became a fabric buyer for Lincraft in the 1990s. She met Chris and joined the wholesale company where he was working. “We continued to work in together in the patchwork and quilting industry until 2011, when we decided to launch our own company,” Fiona said. Two Green Zebras has generously donated multiple prizes, including bundles from the Friedlander collection (not available in Australia until January!) for Carolyn Friedlander’s Judge’s Choice award. Marni Franks has experienced many sides of quilting. She worked for Express Publications where she was in contact with project contributors and working on articles about modern quilting. She also has extensive experience in craft retail, and now as the principal of Frankenstein’s Fabrics, she machine-quilts for customers, teaches classes and dabbles in other crafty things. Marni, who is based on the NSW Central Coast, teaches at her local machine shop, Gosford Sewing Machine Centre. She loves to help quilters of all levels, whether it’s with a product, machine quilting, quilter’s block or just to discuss fabrics and patterns. She’s always ready to use her decade-plus worth of experience. Frankenstein’s Fabrics has had a few changes over the years, but Marni’s passion for her work and the high level of customer service remains the same. She prides herself on helping point people in the right direction for their hobby. Named for her surname and love of the classic ‘Frankenstein’s Monster’, Marni’s business was set out to stand out. Currently on offer at FF HQ are fabrics, haberdashery and quilting accessories, quilt patterns and kits, gift vouchers, custom and pre-made quilts and her special machine quilting service. 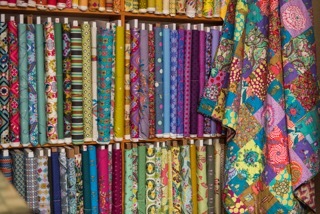 Cottage Quiltworks, located in Warriewood on Sydney’s northern beaches, boasts a wide variety of fabrics: cotton, shot cottons, linen, shirting, solids, pre-cuts, blenders, threads, haberdashery and hardware, and are proud to stock extensive fabric ranges from Liberty, Tilda, Moda, Kaffe Fassett, Japanese, reproductions, 1930 & 1940s, traditional and modern fabrics. Whether you are a beginner or an advanced quilter, Cottage Quiltworks is the ideal community to share your expertise, to learn and to grow. “We have created a ‘home away from home’, with our goal to see our special quilting community grow,” Ariane says. The classrooms at Cottage Quiltworks are designed as a space for comfort, as well as allowing for one-on-one interaction between students and some of Australia’s leading teachers. 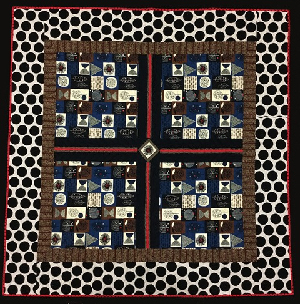 AMQA was established in 2008 to raise the profile of the machine quilting industry in Australia for both domestic and professional quilters, and to provide support for professional machine quilters. 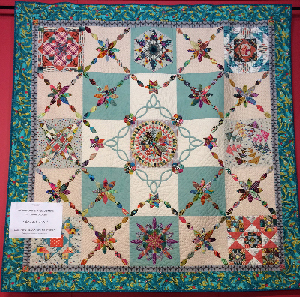 The association holds a judged Machine Quilting Exhibition in conjunction with AMQ Festival every second year. The AMQA Quilt show is the only event of its kind in Australia, dedicated to showcasing the amazing skills of machine quilters, professionals and amateurs alike. The 2016 show was a huge success and we look forward to the next one in 2018. There is also a judged members’ challenge held in the alternate year. The AMQA challenge for 2017 will be providing fabric for the pieced challenge, and the wholecloth challenge theme is “Nature in flight”. This is a judged event, exclusive to AMQA members. The competition was introduced to provide a stimulus for members to push their boundaries, enhance their skills (and win some wonderful prizes!). AMQA facilitates networking among its members through discussion groups on the internet, and has also established a mentoring program. You can also find a list of machine quilting professionals on the website. Lyn noticed this uptake around 2010, by which time her Busy Quilting was underway as a machine quilting business. 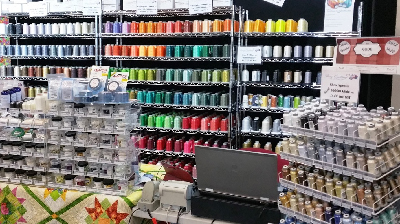 She bought her first APQS longarm machine in 2008, then became the dealer for APQS machines in 2012, and subsequently the Australian distributor for Glide Threads. Walking through the doors of Quiltsmith in Annandale is a treat for any quilter. The broad expanse of shelving is home to so many delicious fabrics from such a diverse genre of fabric styles, and the colour groupings shine across the store. The new Quiltsmith website – www.quiltsmith.com.au , launched in June, has received great feedback. New stock is constantly uploaded, and Quiltsmith’s aim is to make it the go-to source for Australian designers, fabrics and pattern-makers. “Over the past eleven years Quiltsmith has catered to quilters of many different types. It’s been a process, rather than a fixed point in time. Some of our regulars have gravitated towards the modern designers and patterns, and other customers have found their way to Quiltsmith having heard that we stock such eclectic and broad ranges of fabrics; contemporary and modern designers – we stock a large selection of modern fabrics including Cotton + Steel and Art Gallery fabrics, traditional Japanese fabrics, 1930-50’s and 1800’s reproductions fabrics. 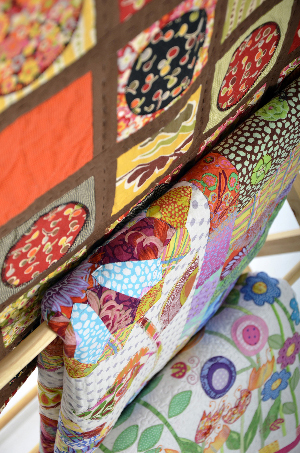 Quiltsmith strives to provide quilters with the fabrics they need to unleash their creativity. 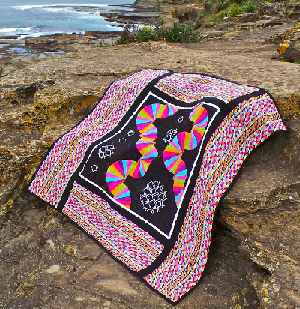 Sue Miller is a member of the Sydney Modern Quilt Guild, Barn Quilters Mosman and Quilt NSW which keeps her fully immersed in the Australian quilting world. Because of her passion for “all things social media”, she has embraced the way that the internet has changed the way we quilt. Fabric Garden is an online business selling a great range of modern quilting fabrics, patterns and supplies. It’s based in Sydney, wholly owned and operated by Sue. Fabric Garden has also developed a reputation among Aussie quilters for Sue’s great ability to spot what’s trending across social media, and stocking hard-to-find products from overseas. Pick up Fabric Garden’s information from the show, and check out Sue’s great deal for MQSA visitors – plus she’ll be running a special deal online over the show weekend. 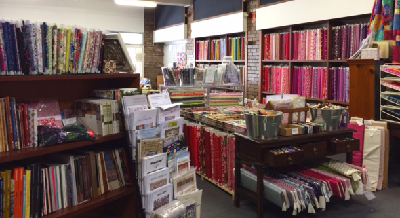 Bernina Australia is a long-time supporter of Australian quilting. A familiar logo at the annual Quilt NSW show in Sydney and AQC in Melbourne, Bernina is also the home machine of many Australian quilters and they’ve been great supporters of the Modern Quilting movement in Australia since the inaugural MQSA in 2014. Bernina is no recent newcomer to the Australian home machine market. Many current quilters learned to sew on their mother’s or grandmother’s Bernina, and have chosen to continue the tradition. Having an easily accessible range of retail service locations, such as My Sewing Supplies in Kirawee, Bernina Sewing Centre Chatswood or Material Obsession in Drummoyne, also makes the long-term care of the home machine a straight forward task. The Modern Quilt Show Australian 2016 is pleased to announce that Bernina has donated the prize for the quilt judged Best in Show. 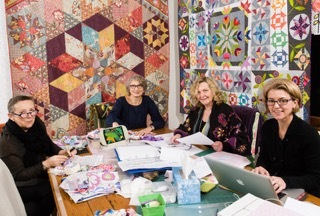 Australian distributors Millhouse Collections, based in Queensland’s beautiful Coolum Beach, first encountered the Modern Quilt Guild in 2013 through the Riley Blake Designs sponsorship and fabric challenge for international members of the US-based Modern Quilt Guild. 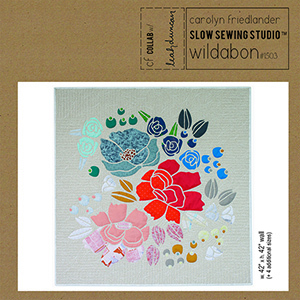 Millhouse Collections are the Australian distributors for Riley Blake Designs, Penny Rose Fabrics, Sue Daley Designs, Soak, Where Women Create and many more quilting brands. Penny Rose Fabrics are an innovative fabric design house for Riley Blake Designs based in the US state of Utah. Inspired by local and international artists, they design fabric lines with vintage sensibilities and modern attitude. Their fabric reflects an elegant feel for colour – vibrant but with restraint – resulting in versatile prints for quilting, clothing, or home décor. Riley Blake Designs’ colourful fabrics include cottons, flannels, sparkle cottons, home decor, knits, linen and many other substrates in a range of designer and basic prints. Their co-ordinating Sew Together line includes of a range of complementary buttons, rickrack, ribbons and lace, fabric kits and panels. 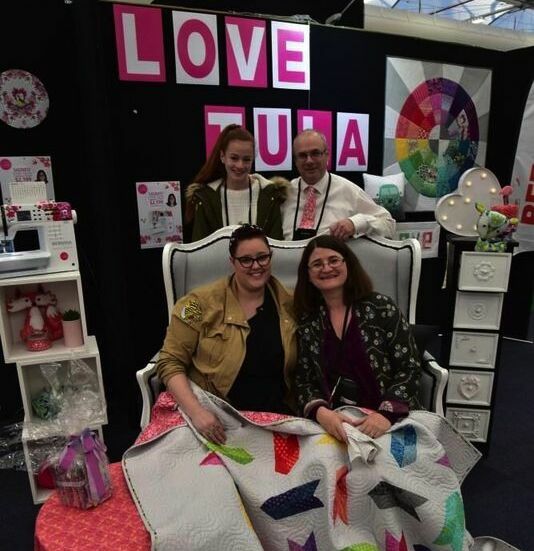 Millhouse Collections is a proud sponsor of the small quilt category at the Modern Quilt Show Australian 2016. Both international designers are holding workshops on Friday 25 November and during the show. In addition, Carolyn Friedlander will speak at the award night on Friday, and Anna Maria Horner will give a lecture on the Saturday evening, both events to be held at the Glebe Town Hall. 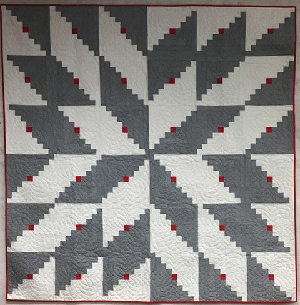 “Being part of the show allows us to meet and greet modern quilters, and understand how we can better meet their needs going forward.” Kathy said. 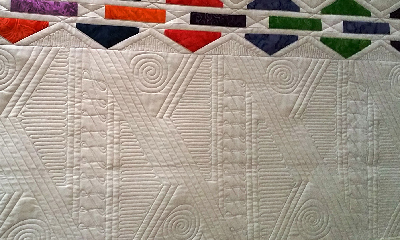 She has observed many changes in the quilting community since 2003. In addition, Kathy enjoys the quilting space shared between modern, traditional, art and all the other categories of quilters. Error: Error validating access token: Session has expired on Thursday, 31-Jan-19 03:34:54 PST. The current time is Tuesday, 23-Apr-19 09:37:23 PDT.